I cannot believe Christmas will be here in just a few short days. Yesterday I shared our Christmas eve, Feast of the Seven Fishes tradition and today I thought I would show you how we make our simple baked salmon fillet. I usually prepare between 7 and 9 fish dishes on Christmas eve and salmon happens to be one of them. This salmon dish isn’t just for Christmas. We eat this year round! It’s actually one of the fishes that we love during the winter months because it doesn’t smell up our kitchen with that awful fish smell. The recipe is below in an easy print format in case you would like to try this for yourself. It is so easy it’s scary! First slice a lemon and chop some fresh parsley. Line a cookie sheet with foil and cover with butter. I decided to make this dish for my husband’s birthday last week so I purchased 2 lbs of salmon fillet at our local market which was plenty for 7 of us. Slice small slits in the salmon large enough to place small pieces of butter inside. You can skip this step or use a butter substitute if you are trying to eat healthy. Once in while though, we eat “not healthy” around here :). 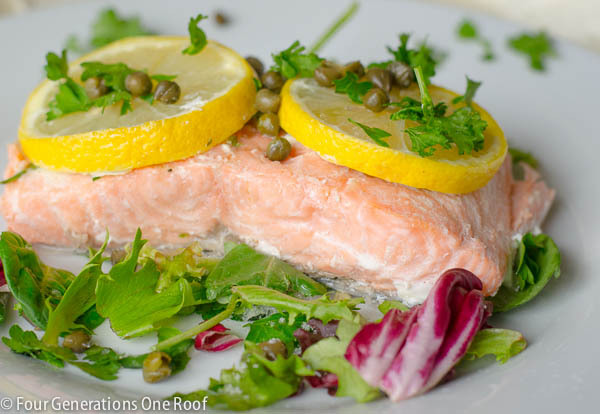 Add capers, lemon slices, pour white wine over fish and drizzle with olive oil. Finish by garnishing with parsley and season with salt & pepper. Wrap loosely with foil and bake for 35-40 minutes. That’s it! The fish is done when it breaks apart with a fork and flakey. This is one of the main dishes we serve during our Feast of the Seven fishes celebration on Christmas eve. I normally will place the salmon fillets on a large platter and cut thin slices so everyone can grab an individual piece. We have so much food on Christmas eve that it’s more of a sampling when it comes time for dinner. I don’t normally photograph food, in fact, I would rather photograph a pillow! ha . My dad saw me photographing this prior to us eating and he said, “are you blogging about food! ?” haha. There are so many different ways to cook salmon, this happens to be our favorite. I know many use parchment paper to wrap the salmon in but I normally use foil, I never have parchment paper when I need it! We don't eat fish much around here, but this looks like something I would like to try! Thanks for sharing! :) Merry Christmas! Look wonderful and so, so easy! Looks delish - I'll give it a go!